The Smoky Mountains have some great outlet and specialty shopping. Visit Belz Factory Outlet World, Pigeon Forge Factory Outlet, or the Tanger Outlet Centers for some great bargains on just about everything (clothing, shoes, accessories, tools, jewelry, infants, watches, belts, home furnishings, etc). So leave the men at the cabin or hotel and hit the outlets (or bring them along to tote the bags). Sevierville and Pigeon Forge have the outlets, but Gatlinburg has some unique shops to browse. Sevier County vacations are filled with shopping delight. So get out there and shop till you drop! For more than 75 years, Gatlinburg, Tennessee, has been one of the most popular tourism destinations in the Southeast. One of the main reasons is the city's proximity to Great Smoky Mountains National Park, but for as long as the park has been in existence, folks have also been coming to Gatlinburg to find authentic, hand-made mountain crafts. Selling crafts to area visitors was originally just a way for local artisans to supplement their income, but over time, it became an industry in its own right and blazed the trail for Gatlinburg to become the shopping destination that it has become today. That is most evident today when you visit the Great Smoky Arts & Crafts Community, an eight-mile loop that is home to dozens of shops and studios featuring the authentic works of mountain craftsmen. But Gatlinburg shopping is much more than arts and crafts. Especially in downtown Gatlinburg, along the Parkway, the streets are lined with shop after shop, offering everything from traditional tourist-style souvenirs like T-shirts and key chains to even more crafts and unique treasures that you can only find in the Great Smoky Mountains. There's something for every age, every preference and every price range. Visitors shopping in Gatlinburg, TN, have several locations that offer the convenience of a high number of retail and specialty shops in one location. Mountain Mall and The Village—both on the Parkway in downtown Gatlinburg—pack a lot into their respective shopping centers. Mountain Mall is a multilevel indoor mall with a wide variety of stores, while The Village is an outdoor, Old World-themed shopping destination with its own collection of unique and distinctive retailers. Even those who take the tramway up to Ober Gatlinburg on top of Mt. Harrison will find a mini mall of sorts up at the ski resort, where even more gift and specialty shops await the Smoky Mountain visitor. If you're looking for gift shops in Gatlinburg, TN, you'll find them just about everywhere you look. Many are located in the Great Smoky Arts & Crafts Community north of town, but if you go to downtown Gatlinburg, you'll find dozens of shops, one after the other, along the Parkway, which is the main street through downtown. Again, the selection runs the gamut, with stores specializing in everything from beads, Tiffany glass, culinary sauces and clothing to Western wear, candles, beef jerky, teas and cheeses, just to scratch the surface. Of course, the work of well-known Smoky Mountain painters and photographers can be found at several different galleries in the downtown area. Another option for finding uniquely themed merchandise is to visit the gift shops of Gatlinburg's many attractions. 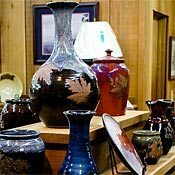 Established in 1937, the Great Smoky Arts & Crafts Community is an historic eight-mile auto loop along Glades Road and Buckhorn Road on the north end of Gatlinburg, just off U.S. 321. More than 50 business (both craft studios and eateries) are located along this route, offering an immense selection of Smoky Mountain crafts in one compact area. The selections range from traditional fine arts like painting and photography to time-honored crafts like pottery, basket making, candle making, jewelry, metal work, leather work, broom making, glass work and much more. Some locations are shops only, although many are also working studios, where you can stop in and visit with the artists as they produce their work. 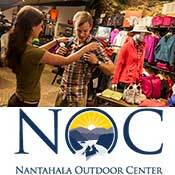 The Smoky Mountains have some great outlet and specialty shopping. Visit Belz Factory Outlet World, Pigeon Forge Factory Outlet, or the Tanger Outlet Centers for some great bargains on just about everything (clothing, shoes, accessories, tools, jewelry, infants, watches, belts, home furnishings, etc). So leave the men at the cabin or hotel and hit the outlets (or bring them along to tote the bags). Sevierville and Pigeon Forge have the outlets, but Gatlinburg has some unique shops to browse. So get out there and shop till you drop! From outlet malls to unique shops that can on be found in Pigeon Forge, TN we make it simple to learn about the Pigeon Forge, TN shopping area. Did you know that Pigeon Forge, Tennessee was voted favorite place to shop in 1996? Since then, many more outlets and stores have opened and the popularity of the area is now a shop-til-you-drop mecca. 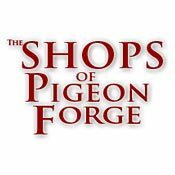 Pigeon Forge offers gift shops, art galleries, jewelry designers, leather shops, handcrafts, factory outlets and many other outlet malls. If you are looking for a one of a kind shopping experience look no further than Pigeon Forge, TN. Located at the entrance of the Great Smoky Mountains, the most visited National Park in the United States, Belz Factory Outlet World, is perfectly situated to greet over 10 million tourists a year, more than 80% of whom are looking for a place to shop in Pigeon Forge. It's also just 5 miles away from the resort area of Gatlinburg, which remains a heavily visited tourist spot all year long. Belz Factory Outlet World is the largest and most convenient shopping highlight in the area, with over 450,000 sq. ft. of enclosed and strip shopping areas. Pigeon Forge's first Outlet Mall, located on the Parkway, the Pigeon Forge Factory Outlet Mall has everything in a shopper's dream. 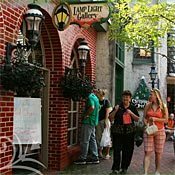 Visit Specialty Stores, Men's and Women's clothing, Infants and Childrenswear, Footwear and Houseware shops, along with our outstanding candy stores and restaurants. You don't want to miss this trip! Shop Brand Name Outlet Stores! We are proud to feature the nation's most popular brand name manufacturers and upscale designer outlet stores such as Liz Claiborne, Eddie Bauer, Reebok and others in our centers. In the past 20 years, Sevierville, Tennessee, has taken its rightful place as one of the state's great shopping destinations. As a gateway city to the established tourism towns of Pigeon Forge and Gatlinburg, Sevierville for many years was often just a place that out-of-towners passed through on the way to their Smokies vacation. These days, however, an abundance of outlet malls, antique shops and other unique "shoppertunities" makes Sevierville a place to stop and visit in its own right. Shopping has always been a natural component of any vacation, especially when you've been tasked with loading up on souvenirs for friends and family back home. And Sevierville has plenty of places where you can do just that. But Sevierville has also become a place where people go to do nothing else but shop, whether it's knocking items off that Christmas list or taking advantage of discount prices and a wide selection of merchandise. 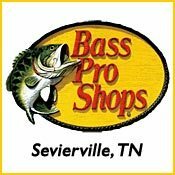 Sevierville shopping offers a little bit of something for just about everybody. You'll find sprawling outlet malls with virtually any kind of merchandise imaginable, and the town-especially in the corridor along Tennessee Highway 66-is also known for it many antique malls and shops, which carry everything from vintage furnishings to treasured collectibles. In addition to the antique stores and outlet shopping in Sevierville, there are a couple of large flea markets from which to choose. After the Great Smoky Mountains themselves, outlet malls are actually the number-two reason why visitors come to the Great Smoky Mountains. 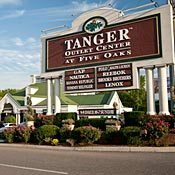 In Sevierville, there are two outlet mall centers from which to choose—Tanger Five Oaks Outlet Center and Governor's Crossing Outlet Mall—both of which offer a multitude of choices when it comes to finding name-brand merchandise at discount prices. Shoppers are attracted to Sevierville outlet malls because of the diverse range of products available. Shops that sell clothing and footwear are in abundance, but it's typical to find a little bit of everything else as well, from jewelry, power tools and house wares to electronics, books and music. And then there are the quality name brands, which include household brands like Eddie Bauer, Liz Claiborne, Tommy Hilfiger, Easy Spirit, Black & Decker and Pfaltzgraff. In most cases, the merchandise is all top-quality, first-run items, offered at discounts as high as 75 percent, because there is no middleman markup. The goods are supplied directly from the manufacturers.